Pictured above are gas prices. If you’re in the United States, you probably barely notice the little numeral 9 underlined and superscripted next to the main part of the price. That 9 is shorthand for nine-tenths of a cent, or $0.009. Premium gasoline, sold above, runs $4.159 — or, effectively, almost $4.16 (and an amount much closer to that than the highlighted $4.15). Prices ending in 9 cents or 99 cents aren’t uncommon in the U.S. or, for that matter, anywhere. But when it comes to gasoline, stations take it one step further. Instead of making sure prices always end in 9 cents, they go one place further past the decimal point. That’s strange for one very obvious reason — consumers don’t have a way of paying .9 cents to, well, anyone. There’s no fractional cent coins, credit cards don’t have a mechanism to charge you fractions of a penny, and your bank would probably flip out if you wrote a check for $4.039. So where did this fraction of a cent business come from? Blame the tax man — and subsequent market opportunism. In 1919, according to the U.S. Department of Energy, gas prices averaged about $0.25. At the time, though, record keeping and price monitoring were not all that robust, and prices varied significantly from state to state and from gas station to gas station; in some places, a gallon of gas could cost as little as 15 cents. Consumers were willing purchasers, regardless, as one’s car needs fuel in order to get anywhere. Similarly, the nation needed roads, and it made sense to tax gasoline sales to fund those avenues — after all, drivers were the ones who were going to use them. Oregon introduced the nation’s first gas tax that same year — and it was a significant one, at 5 cents per gallon. 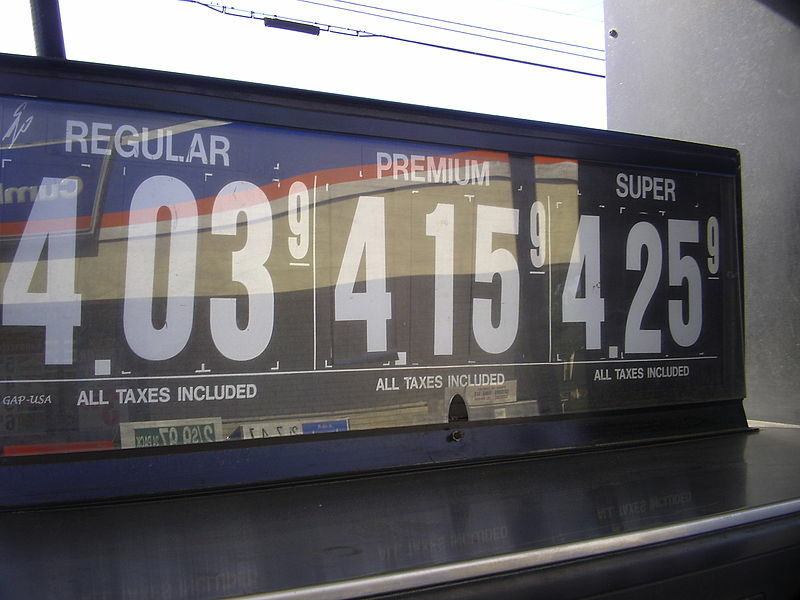 Other states soon instituted their own gas taxes, but not all were as pricey as Oregon’s. After all, a 10% to 33% tax is on the high end, even by today’s standards. The fractional-cent tax has become entrenched over the years; the Federal gas tax is 18.4 cents and not a single state tax rounds that to a whole penny. Consumers, over time, have become used to the fractional cent’s inclusion and likely ignore it. In turn, gas retailers used it to their advantage. Instead of pricing gas a $3.99 a gallon, it’s priced at $3.999 simply because consumers don’t tend to recognize the difference. All those overlooked parts of a penny add up, too; nationwide, those nine-tenths total up to around $200 million to $400 million of additional revenue each year. From the Archives: Add Gas, Get Cash Back: One of the most counterproductive tax loopholes (now closed) in recent years. Related: A toy gas station. Note that the gas is priced to tenths of a cent, just like in real life.